Why Build a Dry Stone Wall? Dry Stacked Food Bar on a Ferry?! When folks ask me what drew me to stone work, I immediately tell them about the Catskill mountains, where I spent most of my childhood. There’s an old folk saying in the Catskills that there’s “two rock for every dirt”, which emerged from the back breaking endeavor to till the rocky farmland. The Catskills are known for their blue stone bedrock,, a dense flat blue-grey rock that once paved the sidewalks of many Eastern U.S. cities. You see this blue stone bedrock in cliffs along the Catskill ridges and in basketball to car-sized monoliths that were dropped by glaciers 10,000 years ago. Chisel-cut edge of a blue stone slab. Strolling through the second growth forests, a wanderer might happen upon crumbling dry stacked walls built by a European farmer who was clearing the land and tilling her fields. I would be more likely to call them piles of stones than walls since a meager amount of craftsmanship has been preserved over the centuries. 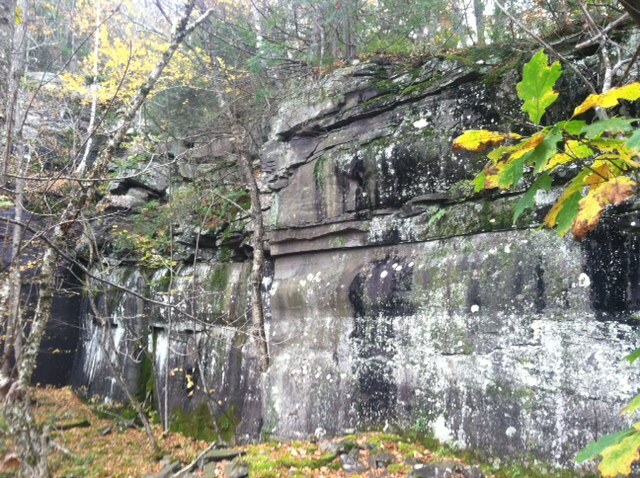 The rocks of the Catskill landscape quickly became stone for me as a youth who played there. Stones have personality; they are imbued with significance, and feeling that I wanted to shape for others as a stone mason. A large glacial erratic might have been a house or a fort for my youthful imagination and a refuge from other imaginary worlds. Glacial till and old farm walls aren’t the only geologic revelations of the Catskills’ blue bedrock. Trekking along the ridge lines a hiker will also frequently come across abandoned blue stone quarries. 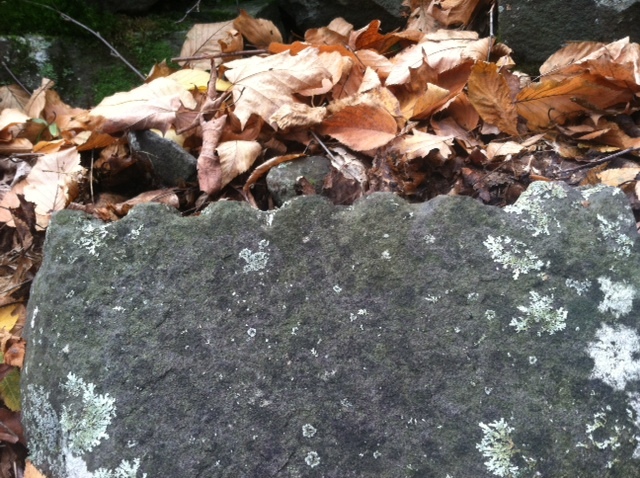 These are recognizable by steep flat quarry walls with large talus or waste rock piles spilling out the opening. It wasn’t long after the European colonizers arrived to the Catskills that they saw an opportunity to exploit this resource to pave the sidewalks of their growing industrial cities. Thankfully blue stone quarrying wasn’t a polluting industry and the blue stone relics (old quarries and expertly crafted side walk stones) that dot the landscape are only minor scars on the land. 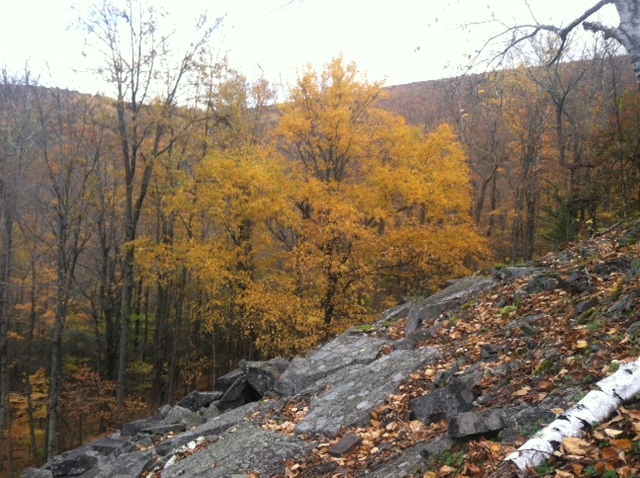 View over Mt Tremper quarry talus pile. If anything they fill the trekker’s imagination of stories of how these anomalous piles of shaped stone and high fortress-like walls came to be. I made an investment in the quality of my walls and the quality of my health this weekend by building a stone dressing table. A dressing table is used on site for “dressing” stones or shaping them for building. Being able to stand while cutting and chiseling stones makes for stronger and more accurate dressing while also keeping my spine aligned which strengthens my back. I followed Don Dougan’s plans,which I found after a quick Google search. The plans were exactly what I was looking for because I could build a table that was affordable (less than $50), strong, portable and quick to assemble. 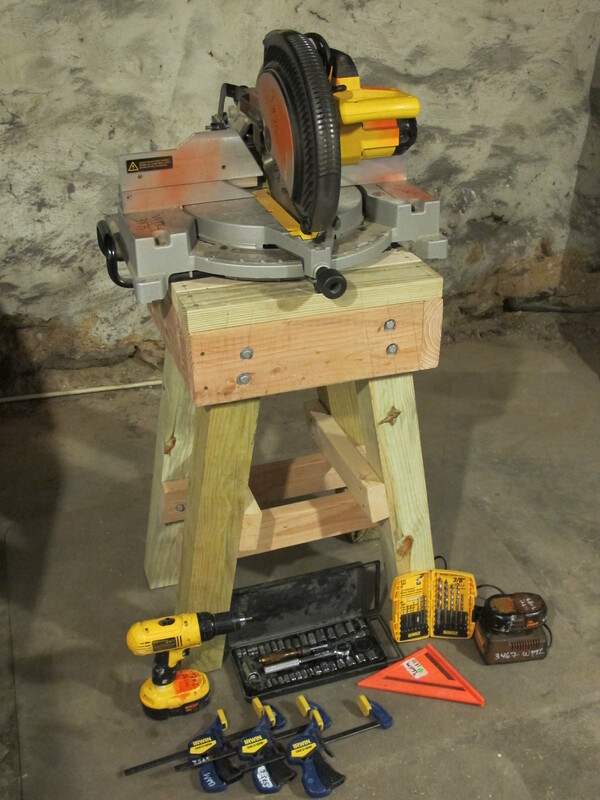 I also have to thank the West Philly Tool Library for lending me the following essential tools: a 12″ chop saw, three clamps, a socket wrench, a drill, a 3/4″ drill bit, a 1/8″ drill bit, and a speed square. Tools from the West Philly Tool Library. The table is designed for stone carving and can hold one thousand pounds. I won’t be lifting that much weight and made some slight modifications to accommodate the needs of a waller. I brought it out on the job site already and it’s a pleasure to use. 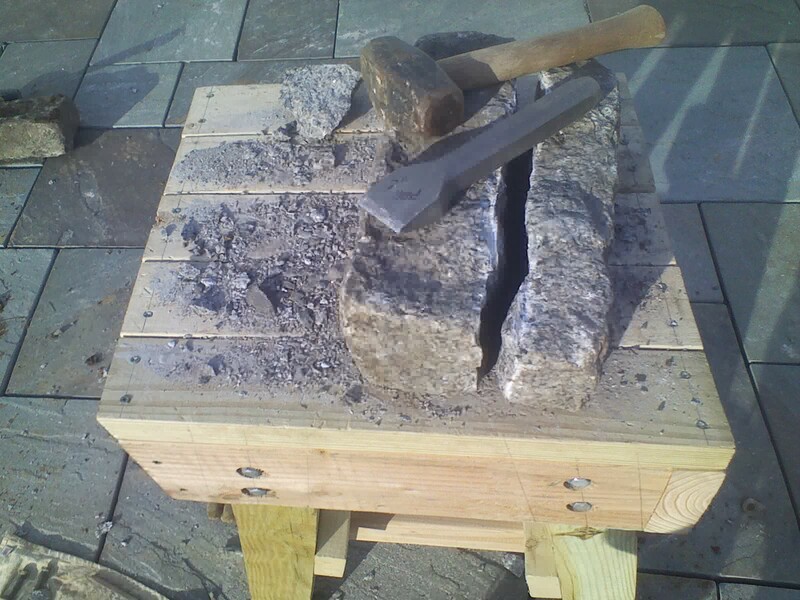 Below is an image of a begian block (large cobble) I split using a 2″ carbide tipped tracer chisel. Here are some images of its assembly. My partner is a carpenter and built this with me. 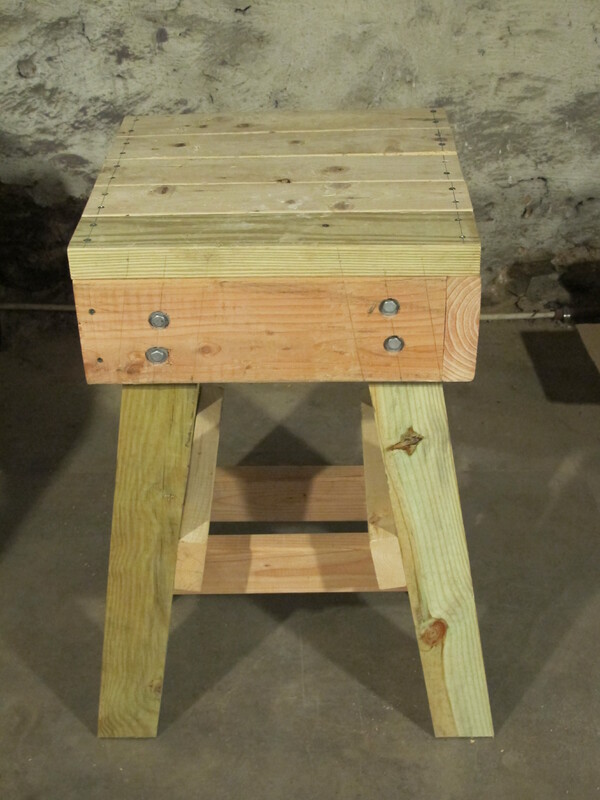 I had to find a creative position to shorten and level the legs with a miter saw. Before the leg braces were added. 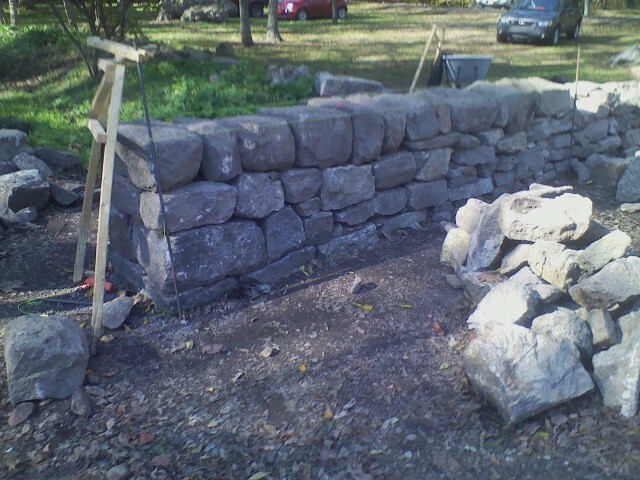 I only have this photo of the beautiful wall we rebuilt. Unfortunately I didn’t get a photo with the participants. I’ll have to update everyone when I get a copy shared with me! I think hard about community organizing and stone masonry. So when the two intersect, all sorts of colorful fireworks explode inside my head. Last week I was invited by John Grablewski of French Creek Masonry and the West Nantmeal Historical Commission to co-facilitate a dry stone walling workshop which happened yesterday. I met John recently through the dry stone walling community and he’s been extremely generous in supporting my work. At the workshop, I felt inspired by the West Nantmeal community’s plan to restore over three miles of dry stone walls that line the township roads. The historical commission has been organizing to revive the dry stone craft in West Nantmeal so homeowners can maintain the historic dry stone walls that roll over their lawns. John and I gave this workshop to help them build capacity for that vision. I hope to return soon for more workshops and the next historical commission’s meeting where I can learn more about the community’s strategy. While dry stone construction is old, so is mortared construction techniques though according to this article on Roman concrete, the carbon footprint was much lighter. A great video by Rockin Walls on why build dry stone and not a mortared wall.